The Epsilon Launch Vehicle is a solid propellant rocket suitable for a new age, delivering both high performance and low cost. Based on the M-V Launch Vehicle, a multistage solid propellant rocket with the best performance in the world (discontinued in 2006), we try to achieve improved performance with the Epsilon Launch Vehicle, and build a system which will allow the frequent launch of launch vehicles by largely-reducing operational costs through enhancing aspects of operational efficiency, such as assembly and inspection. Through increased launch opportunities, we anticipate that space development activity will increase. The biggest goal of the Epsilon Launch Vehicle is to make space more accessible as rocket launches are made easier. Conventional launch vehicles required a significant period of time and effort to launch. With the Epsilon Launch Vehicle, launch systems are improved and simplified in order to reduce time for launch preparation. This will make times to launch the shortest in the world. Notably, the inspection of on-board devices will be done autonomously by the launch vehicle itself, thus streamlining inspection on the ground. This advance will allow the launch control of launch vehicles to be done anywhere in the world, simply by connecting a laptop computer to the network. This means having an ultimate launch control system which is independent of launch sites. We believe that these innovative concepts are a world first, and will be a role model for future launch vehicles. The Japan Aerospace Exploration Agency (JAXA) cancelled today's [Aug. 27] launch of the first Epsilon Launch Vehicle (Epsilon-1) with the Spectroscopic Planet Observatory for Recognition of Interaction of Atmosphere (SPRINT-A) onboard from the Uchinoura Space Center, because an automatic stop alarm was issued as an attitude abnormality was detected approximately 19 seconds prior to the liftoff time during the automatic countdown sequence. 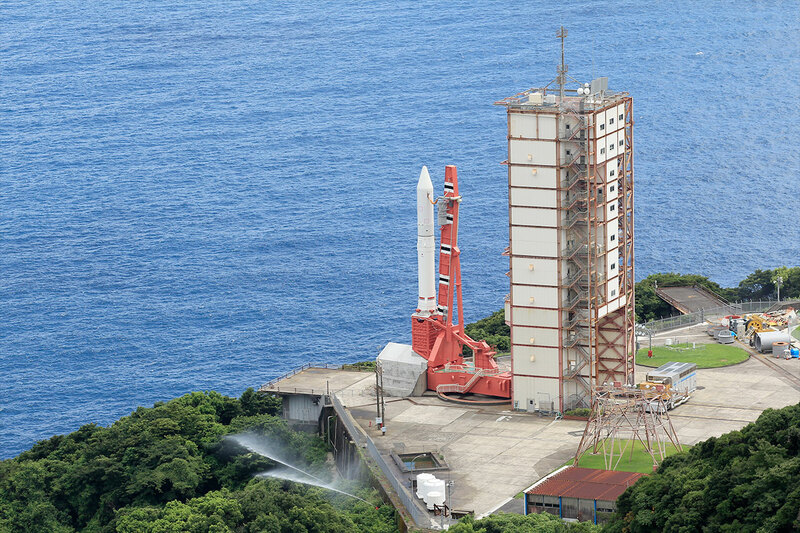 The launch had been originally scheduled for 1:45:00 p.m. today (Japan Standard Time). Man, I SURE hope that that picture was taken well before the scheduled launch, and not 19 seconds before hand. Look at the poor bugger down in the bottom center left portion of the picture spraying water on the trees. If you've got to do that just before, and in that case most likely during, launch... Wow, talk about a hazardous job. The photo was taken on Aug. 20, a week ago. 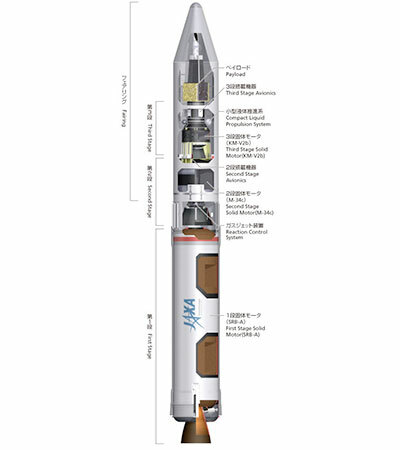 JAXA would like to announce that we have set the launch date and time of the first Epsilon Launch Vehicle with the Spectroscopic Planet Observatory for Recognition of Interaction of Atmosphere (SPRINT-A) onboard as follows. JAXA launched the first Epsilon Launch Vehicle (Epsilon-1) with the Spectroscopic Planet Observatory for Recognition of Interaction of Atmosphere (SPRINT-A) onboard at 2:00 p.m. (JST) on Sept. 14, 2013 from the Uchinouora Space Center. At the time of the launch, the weather was cloudy, a wind speed was 8.1 meters/second from the east-north-east and the temperature was 27.2 degrees Celsius.